2014 Caribbean Seminar with Andres Aportela. 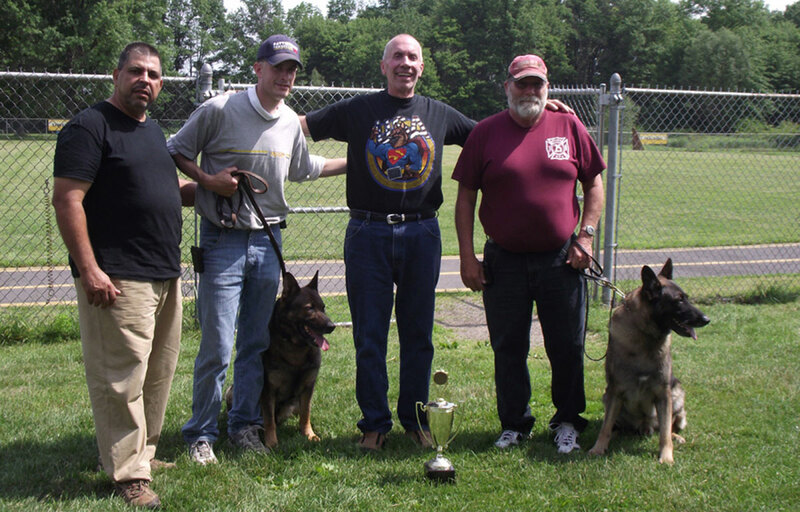 The Pattenburg Volunteer Fire Company Search and Rescue Team in Clinton, NJ lead by Fire Chief Dan Van Fossen would like to extend heartfelt thanks and gratitude to our Trainer/Director Andres Aportela for sharing his superior knowledge and expertise in the field of tracking, schutzhund, and training working dogs. 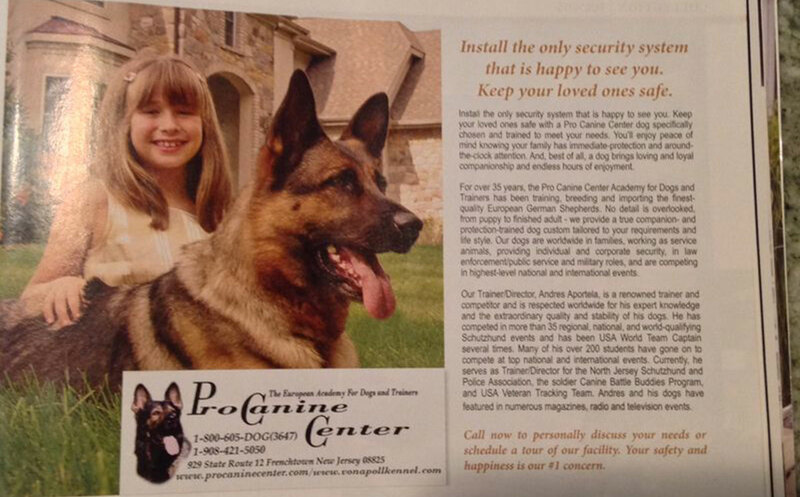 As Master Trainer/Director of the ProCanine Center in Frenchtown, NJ, Andres imports, breeds, and trains European German Shepherd working dogs. 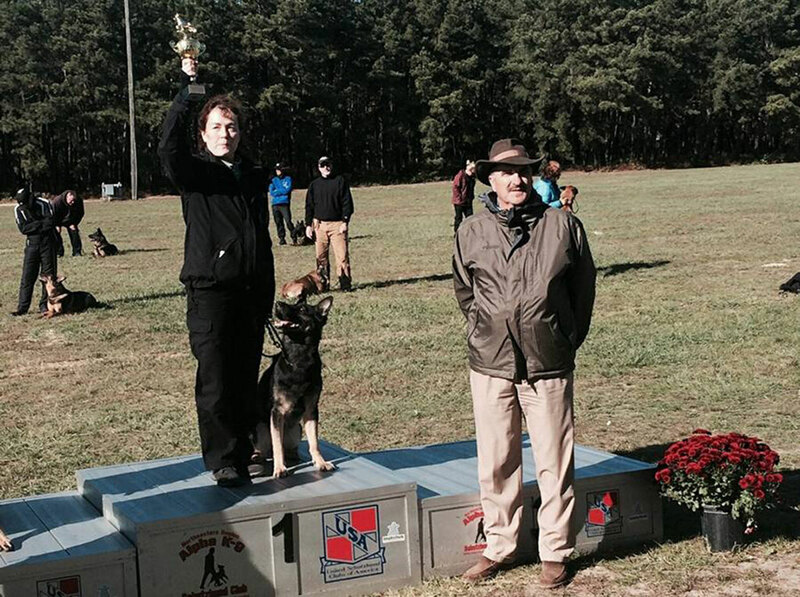 For over 25 years, he has been a licensed canine DEA Narcotic Certified Instructor and has trained numerous students that have competed in regional-, national-, and world-level events. Since 2007, Andres has qualified five times for the tracking FH World Championship and has served three times as FH World Team Captain. 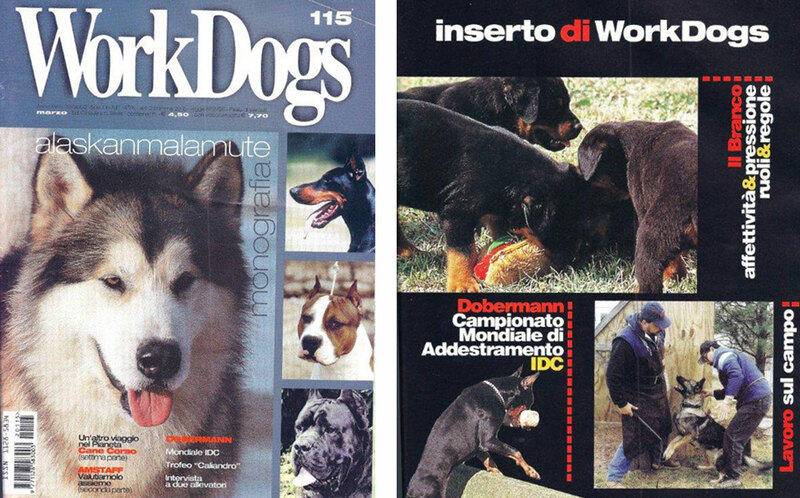 His dog Franka Vom Wallerhorst made history as the top-scoring female representing the United States in the 2009 FH World Championship held in France, and his dog Benga Aus Kingston Village was the highest scoring tracking FH dog in 2010. Andres’ dog Benga lends a helping paw to the community by assisting the Team with searches when needed. The Search and Rescue Team dogs, Bondi Aus Kingston Village and Timmy Vom Ortenberg, trained by Andres hold the highest level tracking and search and rescue titles with testing scores in the excellent category. 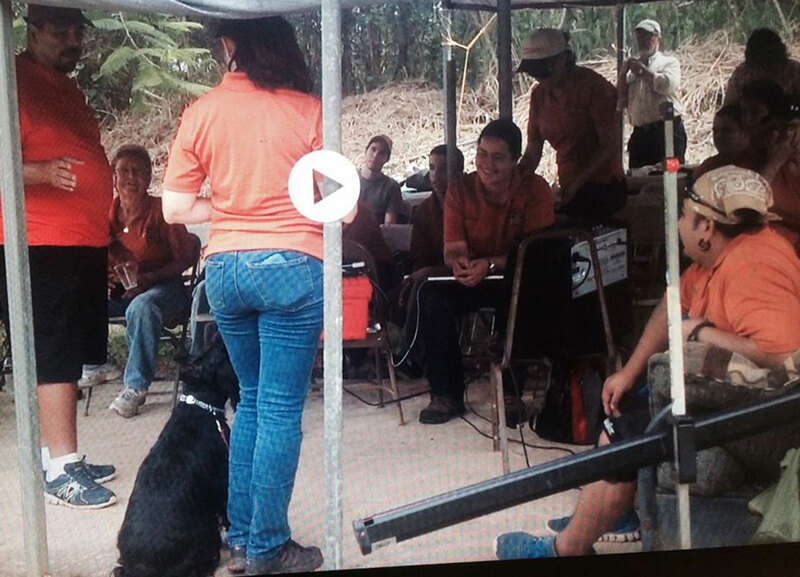 Both dogs have exceeded expectations and are credited with numerous finds of lost individuals across the region. 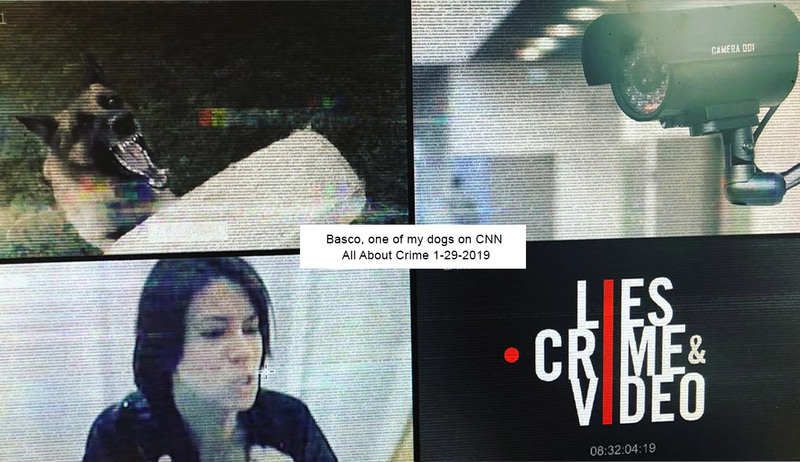 Andres Aportela appeared on CNN as part of an expert panel regarding a North Carolina police K9 incident. His insight and opinion based on many years of relevant law enforcement training expertise was well received and a valuable contribution to the conversation. Tim Vom Ortenberg (AKA: Timmy ) was there, sitting or standing quietly as the ceremony went on. He didn’t know what all the fuss was about at the Bethlehem Township Committee meeting Thursday night. 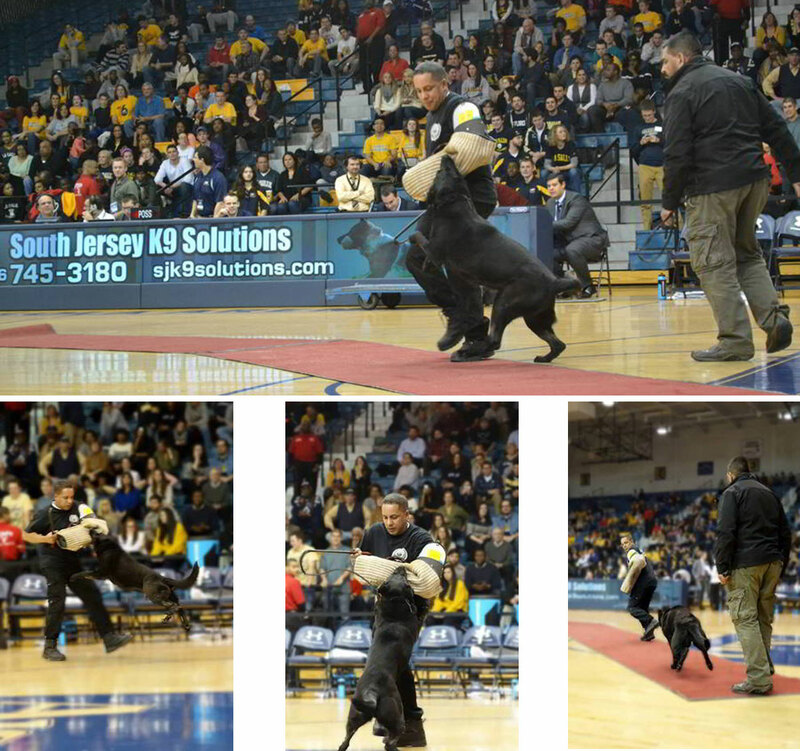 Timmy is a 6-year-old German shepherd, present because his handler was being honored. But William Hardenburg wasn’t there. The longtime fire and rescue volunteer was killed at the age of 67 in an accident while working for a contractor cleaning up storm damage after Hurricane Sandy. Hardenburg and his stepson, Chief Dan VanFossen of the Pattenburg Fire Company, acquired Timmy two years ago and had him trained as a search-and-rescue dog for the fire department, to help find missing people, such as persons with Alzheimer’s disease who wandered off. 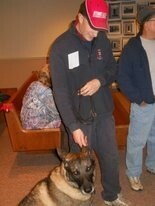 VanFossen thought it very appropriate to bring Timmy to the township’s Holiday Celebration and award ceremony. Besides Hardenburg, three other people were honored: longtime recreation volunteer and coach Cliff Tanzler— who also died this year — and Richard and Jill Prakopcyk. He is noted for the township’s thriving lacrosse program, the Warriors, and she for constantly volunteering for the town, her church, the North Hunterdon Booster Club and many other groups. Mayor John Graefe told of how Hardenburg “loved being a resident and to help protect the residents.”He was township Office of Emergency Management coordinator the past four years. After Sandy, he ran the area emergency center for four days, 24 hours per day during which he answered innumerable phone calls and responded to many incidents. As a volunteer with the Pattenburg Rescue Squad, “Bill went on 345 calls over the past two years as a first responder” and was also volunteer with the Pattenburg Fire Company, Graefe said. Over the past five years he answered more than 2,000 fire calls. Both volunteer agencies help cover Bethlehem. “Bill was on call 24-7, 365 days per year for the fire company, the rescue squad and the township OEM. Bill would try to help anyone at any time ,” Graefe said. And he “helped many elderly Bethlehem Township residents by fixing their broken equipment — anything from sump pumps to generators to cars,” the mayor added. His wife, Cathy, and VanFossen accepted the award in remembrance of Hardenburg. 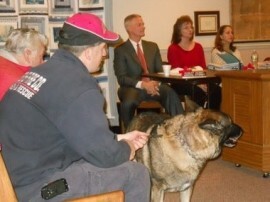 VanFossen on Wednesday night had taken both Timmy and his their other tracking dog, Bandit aus Kingston Village (AKA: Bandy), to the Union Township Committee meeting. The fire company, based in Union, serves parts of both townships. Cliff Tanzler died June 16 at the age of 51. The community lost a member whose kind, gentle, generous and caring ways touched so many,” said Tom Berger and Cindy Szokol, close friends of Tanzler. They both spoke of his many accomplishments. Both Cliff and his wife, Sharon gave so much freely and willingly for the betterment of the community, they said. They were early on in the township recreation program and while she started and ran the snack shack concessions to raise money for the ever-growing program, he began coaching girl’s sports when his daughter Julia was a kindergartener. For more than nine years he coached soccer and softball and several years coached two teams at once when not enough coach volunteers stepped up, Berger noted. “Cliff cherished the opportunity to positively influence kid’s lives through his sense of kindness and lessons of sportsmanship and community.” In addition to running his own business, Critical Path Project Management, he taught engineering and business courses as an adjunct professor at Lehigh University. He helped build the Heritage Park playground in 2003 and was always on hand to assist with the Hoppock School play, whether helping to paint the stage or assist with the prop construction. Additionally he devoted many hours as a vestry member of the Church of the Holy Spirit and volunteered his expertise with Mr. Fixit of Hunterdon County. Richard and Jill Prakopcyk are well-known for their involvement in both sports and other activities A standout lacrosse player at Hunterdon Central High and Rutgers, he was cited for helping start Bethlehem’s program in 1998, one which has grown tremendously. According to Graefe, “his leadership and mentorship brings boys to the program, not just from Bethlehem Township, but from all the surrounding towns. His reputation is fantastic and the head coaches and commissioners who work with him have also stayed on through the years." He donated his time designing and helping with the original plans for Huczko fields and also gave his services designing the national lacrosse monument to be erected in Baltimore. “Rich has taken his passion and passed it on to hundreds of children. His dedication to the program has brought accolades to our town,” Graefe said. “Richard and Jill are always thinking of the importance of serving others and ensuring that they have a meaningful and enjoyable experience,” the mayor said. Jill received praise for her extensive involvement in township recreation, implementing the annual Holiday Luncheon for senior citizens and for continuing to serve as NHHS Booster Club president even tough her youngest son graduated two years ago. 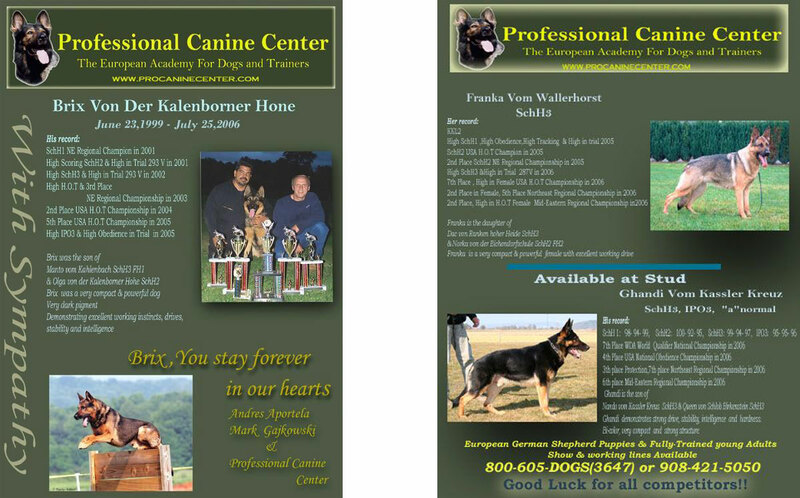 Pro Canine Center / Von Apoll Kennel was the importer and trainer of Tim Vom Ortenberg and Bandit aus Kingston Village. Andres Aportela's workshop for Animal Alliance volunteers January 13,2008 Andres Aportela, world-renowned dog trainer and Owner of Pet Country Club/Professional Canine Center in Frenchtown held a workshop for Animal Alliance volunteers at Susan's Houndstooth Inn in Lambertville on Sunday,January 13, 2008. Andres contributes much of his time and expertise throughout the year to Animal Alliance, and donated the proceeds of the event to the organization. 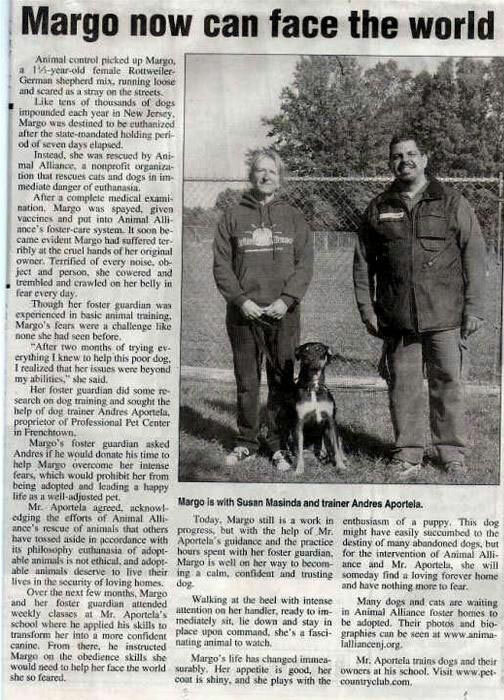 The goal was to better educate the Animal Alliance volunteers in all aspects of evaluating and the subsequent rehabilitation of dogs with issues prior to adoption so they will be great pets. Socialization and neutralization of all types of aggressive behavior was discussed. The dog must always think of its human as the "Alpha" by being their "Security point of trust," and the human must "never reinforce negative behavior." Susan Masinda an Animal Alliance volunteer and student of Andres demostrated how Rusty, a formerly " stranger aggressive" dog has learned to trust through obedience training, and is now ready to be adopted. Another dog, Davie, whose initial assessment by Animal Alliance was that he had some aggression issues, was brought in as a demonstration dog. In five minutes with Andres' expert analysis and coaching, Davie was being walked by different members of the group, sitting on command, and all were able to pet and walk him with no worries. Andres explained that Davie needed a job; he had lots of energy and just needed it redirected to something positive. 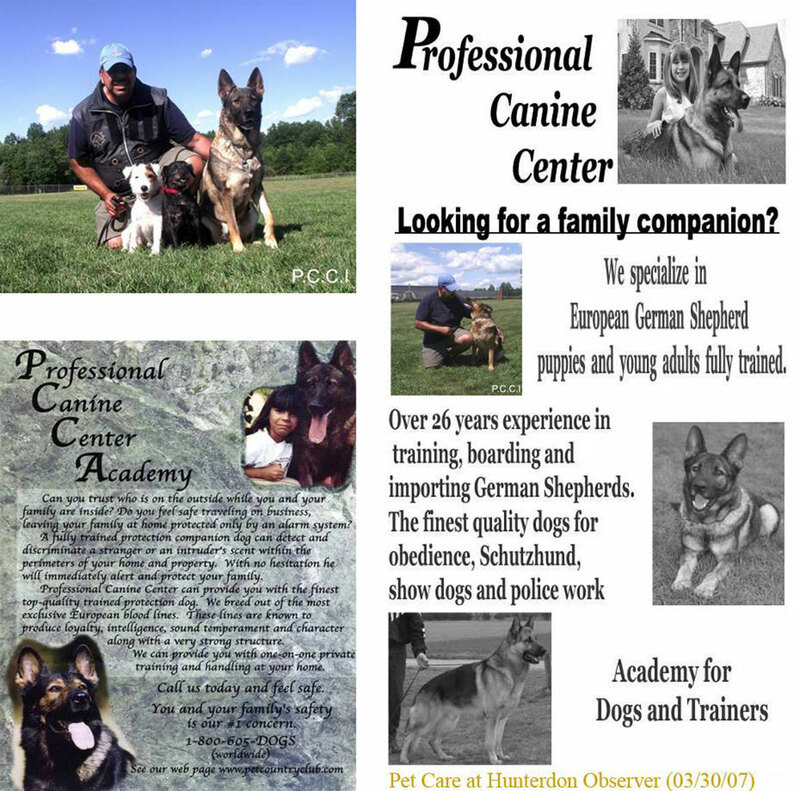 Training and breeding German Shepherds for over 25 years at his sprawling and state of the art facility, Andres has spread his knowledge throughout the world to places such as Puerto Rico, Germany, Italy, South America and many parts of the United States. Andres says, " All dogs are capable of learning basic obedience. All dogs are also capable of learning how to stop behavior problems. 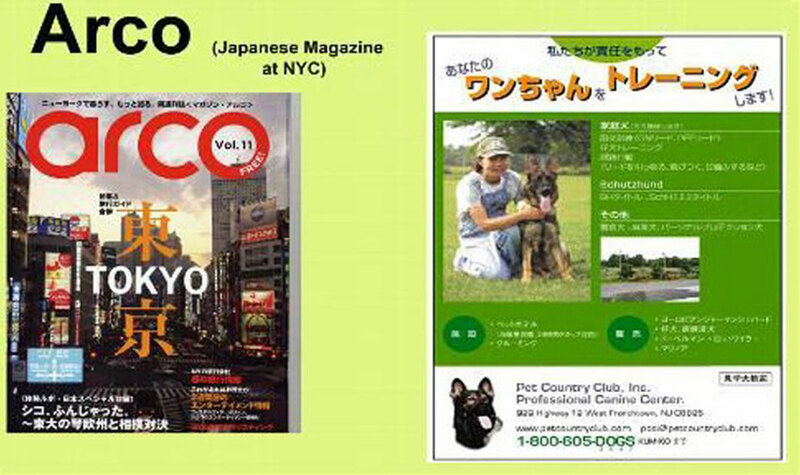 The most important thing in training a dog is to continue the training when he or she is home." 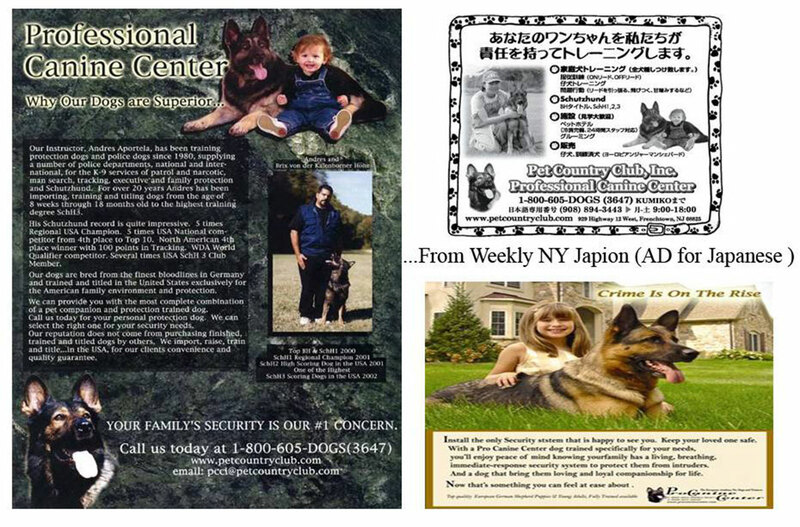 Visit www.procaninecenter.com and discover how you can have a well- trained dog. Andres does specialty consultations on behavioral problems as well as obedience classes, and master's classes for experienced handlers and dog trainers. Susan's Houndstooth Inn offers safe and fun daycare and boarding for dogs with individual "suites" instead of metal cages or runs. Through a community partnership with Animal Alliance, Susan's Houndstooth Inn hosts pet adoption days, trainings, and small fundraisers to benefit Animal Alliance. See www.susanshoundstoothinn.com to learn more. 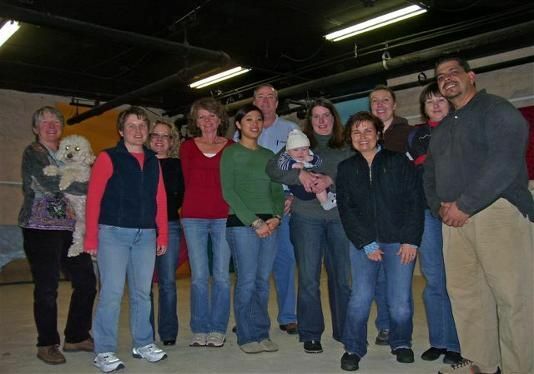 Photo L to R: Susan Masinda with Rusty, Heather Edwards, Mary Rudder, Susan Manks, Chelsea Manks, John Rudder, Nancy Remler with JJ Parker, Anne Trinkle, Hana Dariusova, Susan Brown, Andres Aportela. Animal Alliance, a 501(c) 3 nonprofit charitable organization, is a volunteer organization that rescues animals in immediate danger of euthanasia from several animal shelters.Animal Alliance places animals removed from the shelters into foster homes where they are rehabilitated, spayed/neutered, restored to health, and readied for a speedy adoption to carefully chosen adoptive families. Animal Alliance finds euthanasia to be an unacceptable fate for adoptable animals, and strives to educate the public about the surplus of adoptable animals in shelters, the critical importance of spay/neuter, and responsible pet ownership. Visit www.animalalliancenj.org to see pets currently available for adoption. Andres Aportela's Seminars with Animal Alliance. 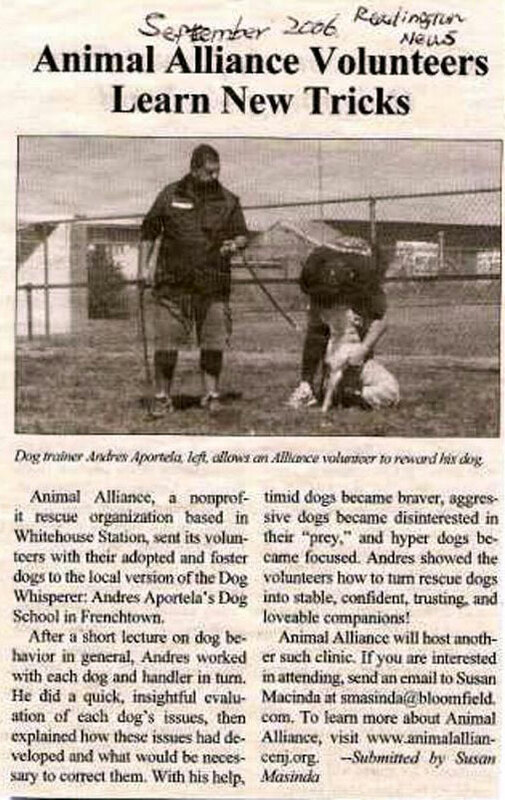 "World- Renowned Dog Trainer Andres Aportela conducts Dog training Clinic for Animal Alliance." Animal Alliance volunteers brought their adopted and/or foster dogs to Andres Aportela's Dog school in Frenchtown this past August to attend this special clinic. After a short lecture on dog behavior in general,Andres worked with each dog and handler in turn. It was thrilling to watch him do a quick,insightful evaluation of each dog's issues,then explain how these issues had developed and what would be necessary to correct them.We watched in amazement as timid dogs became braver, aggressive dogs became disinterested in their "prey" and hyper dogs became focused. All the Volunteers were very impressed by Andres' talents. some came away with more insight into their dog's behavior and how to modify it, some will be returning to Andres' school for further training. Many thanks to Andres for showing our volunteers how to turn our rescue dogs into stable, confident, trusting and loveable companions! Animal Alliance gratefully acknowledges your donation of a Master's Level Dog Obedience private training class, valued at $3,000. This generous donation allowed "Margo", a once troubled, almost unadoptable, but potential- filled Rottweiler mix to attend your private dog training class "on scholarship." As you know, Margo rose to a high level of obedience and performance after training with you over several months and is now highly adoptable to anyone that wants a devoted, obedient, perfectly trained dog! Animal Alliance, a 501(c)3 nonprofit charitable organization, is a volunteer organization that rescues animals in immediate danger of euthanasia from several animal shelters. Animal Alliance places animals removed from the shelters into foster homes where they are rehabilitated, spayed/neutered, restored to health, and readied for a speedy adoption to carefully chosen adoptive families. 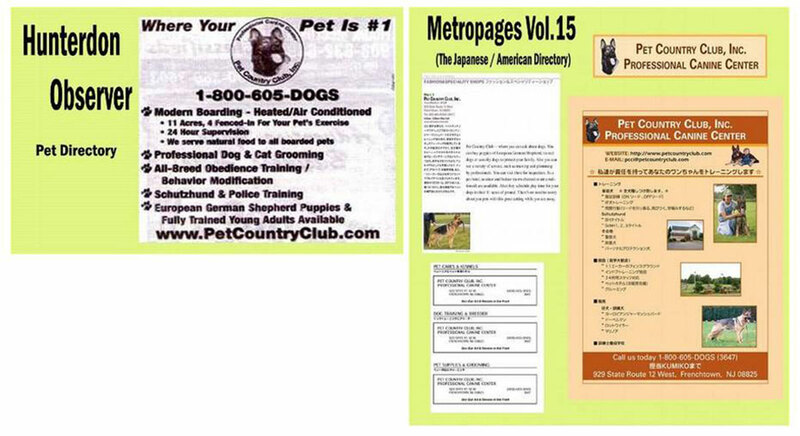 Your generous donation made in honor perpetuates kindness and goodwill to animals.